Review Summary: MERE BAAP PEHLE AAP is enjoyable in parts -- an entertaining first hour a not-too-entertaining second hour. Mere Baap is cinema as Chinese torture. Why would Priyardarshan give up comedy for some semi-serious drama about a father-son duo (Paresh-Akshaye) who try to outdo each other in playing the guardian? 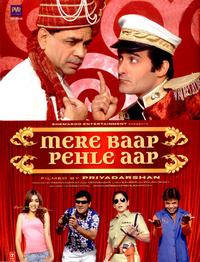 MERE BAAP PEHLE AAP is enjoyable in parts -- an entertaining first hour a not-too-entertaining second hour. The self-explanatory title sums up the film’s premise succinctly. Years back, when Priyadarshan and Akshaye Khanna had come together, they created some Hungama and Hulchul. Whenever a Priyadarshan film comes around there's always some good amount of laughter that's guaranteed with the likes of Paresh Rawal , Rajpal Yadav and much more. When it comes to Priyan it doesn't really matter whether it's a 'Kumar' or 'Khanna' rather it's the name 'Akshay(e)' that matters. Mere Baap Pehle Aap could have been so much better. The length is a major problem; also it could have been lot funnier. A disappointing movie from Priyadarshan. To sum up the experience of Mere Baap Phele Aap would take another two paragraphs. So in short, just go and enjoy the movie. It is a 100% entertainer and can be enjoyed with the whole family. We assure you it’s a worthwhile watch.